Innovative Power Products: Home | News | IPP-7112 and IPP-7114: New High Frequency 90 Degree Surface Mount Couplers up to 12.0 GHz. 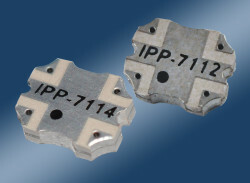 IPP-7112 and IPP-7114: New High Frequency 90 Degree Surface Mount Couplers up to 12.0 GHz. Innovative Power Products introduces two new High Frequency 90 Degree Surface Mount Coupler models IPP-7112 and IPP-7114. 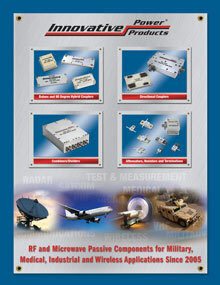 These surface mount couplers are conservatively rated at 50 Watt CW, and operate from 8.0 – 12.0 GHz. and 6.0 – 12.0 GHz. respectively. The IPP-7112 and IPP-7114 website pages list the complete product specs, and provide links to pdf files of the detailed Outline Drawings and the Typical Test Data results for several parameters. In addition, these product pages also offer links to the Simulated S-Parameters in s4p format, and the PCB Mounting Footprint in dxf format. IPP also offers other Broadband / high frequency 90 Degree Couplers.